The 21-year-old actress - who shot to fame in 2001 playing Hermione Granger in the 'Harry Potter' franchise - admits she has experimented with alcohol in the past and got very intoxicated, although insists it's not a regular occurrence. Speaking on 'The Late Show With David Letterman' in New York, the British beauty said: "Yes I have tried spirits, we drink at 18 in the UK but I'm actually legal to drink here now, it's worth mentioning. Yes, yes I have. I got very very drunk once in my life as everyone does. Fine I got drunk, I have been drunk - and I'll bow to that!" 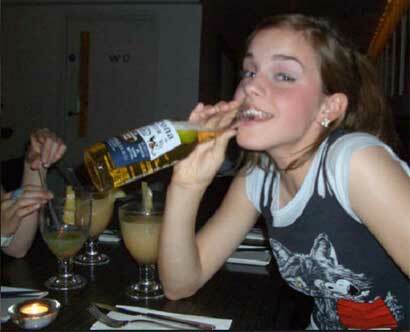 Although she admitted to getting drunk, when asked if she had ever peed on the subway, Emma replied: "No it's never gotten that bad - thankfully it's never been that bad." While Emma is sensible with her drinking, her 'Harry Potter' co-star Daniel Radcliffe recently confessed he became "reliant" on alcohol when he was 18. The 22-year-old actor - who has now given up drinking - said: "I became so reliant on alcohol to enjoy stuff. There were a few years there when I was just so infatuated with the idea of living some sort of famous person's lifestyle that really isn't suited to me."